to provide a wide range of services. • Nutrition services for limited food resources. • Utility Assistance: prevent disconnection of utilities or to restore services. • Housing Assistance: prevent eviction, to obtain suitable housing, or provide assistance to homeless families transitioning to permanent housing. • Education Assistance: purchase books, supplies, or tuition for basic skills/GED education when financial aid has not been received. • Employment Assistance: purchase employment required clothing, fees, or dues when no other program is available; to purchase books, supplies, or tuition for vocational training when financial aid has not been received. • Workshops on financial planning, nutritious meal planning and preparing a shopping list from planned meals. 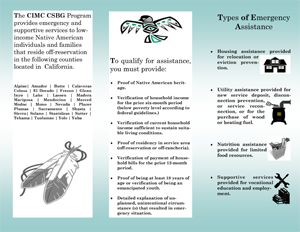 The Emergency Food and Shelter Program (EFSP) was established in 1983 by U.S. Congress with the intent of supplementing local efforts to provide emergency food and shelter to people during economic emergencies with funding through the U.S. Federal Emergency Management Agency. 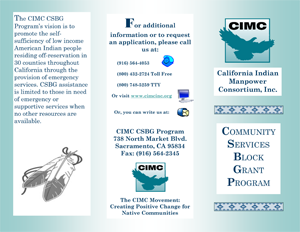 California Indian Manpower Consortium, Inc. (CIMC) received EFSP funding for Sacramento County and Yolo County which supplements the CSBG Program nutrition assistance services for these counties. Food vouchers are issued through the CSBG application process until this supplemental funding is exhausted for each funding cycle.